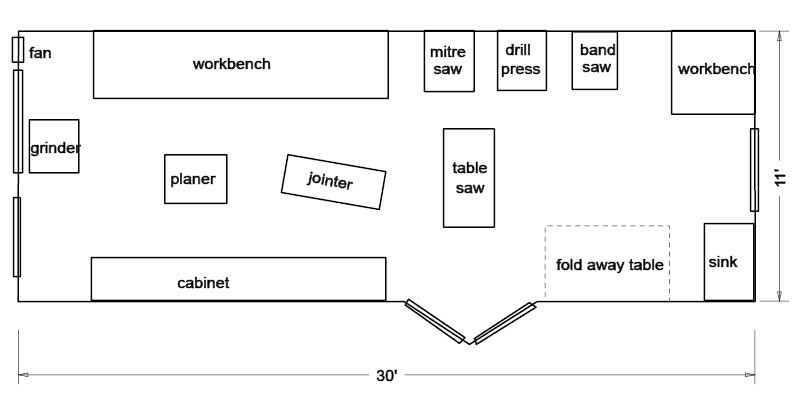 Layout, lighting, power points, power tools, hand tools, general material, storage, and dust collection. There are lots of good books and articles in woodworking magazine explaining what a good woodworking shop should look like and what should be in it. As far as I am concerned a lot depends on the space you have available, what kind of projects are you going to tackle and which power tools are you using the most. It is always a matter of compromise. For example, when I started I had an empty space and installed all the lights and power points I would ever need. Yeah, right. Let me tell you, you have never enough power points and they are never in the right position. Mortise & Tenon Jig Leigh Frame Mortise & Tenon Jig; makes mortises/tenons from 1/16" x 1/8" to 1/2" x 2-1/2"
Doweling Jig General 840 Doweling Jig; dowel sizes 3/16", 1/4", 5/16", 3/8", 7/16" and 1/2"
Measuring tapes/rulers, squares, compass, calipers, hammers, pliers, screw drivers, wrenches, saws, rasp/files, chisels, carving knives, scrapers, clamps, router bits, drill bits, etc.. Updated: 5-Feb-2019 21:52 EST -- Copyright © 2003-2019 Pieter van Vliet. All rights reserved.